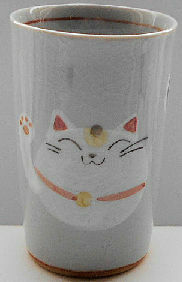 This stoneware tumbler features the image of a greeting cat. The tumbler is 3 7/8" high x 2 1/2" in diameter across the top. This stoneware can also be used as a little vase. Dishwasher & microwave safe. Previously owned but in good condition.